The world thermal insulation market is gaining advantage from various government supported environmental regulations that have been formulated and implemented for the purpose of conservation of energy in various buildings. To be more particular, governments of various cold countries are taking interest in this and are actively making a promotion of zero energy loss buildings which can be obtained by means of credible materials of thermal insulation. In accordance with an analysis by the institute for Energy Diversification and Saving or IDEA, improvements in thermal insulation could account for up to 30% fall in air conditioning and heat consumption so as to translate it into savings of money and energy and also resulted into diminished emission of CO2 as well. The world market for thermal insulation is characterized by the strong presence of many international and global market vendors and this accounts for a landscape that is markedly fragmented. The said report has taken into account many major thermal insulation manufacturers such as URSA Insulation S.A, Armacell, Isolatek International, ROCKWOOL International A/S, Asahe Kasei Corporation, The Dow Chemicals Company, Johns Manville, Saint-Gobain S.A, BASF SE, Thermax Jackets LLC, DuPont Insulcon Group, Owens Corning, Covestro AG, and Kingspan Group Plc. Amongst many others. A report by Transparency Market Research makes estimation that the world market for thermal insulation could reach a market valuation of around US$ 77,770.7 mn by the end of the year 2025, thereby increasing from an earlier valuation of around US$ 48,288.3 mn in the year 2016 expanding at a growth rate of 5.4% CAGR in between the years 2017 and 2025. The major geographies into which the world market for thermal insulation has been categorized are North America, Europe, Asia Pacific, Latin America, and the Middle East and Africa. These are considered to be the prime regional markets for the industry of thermal insulation that have been delved into and studied thoroughly in this market research report. Amongst all of these regions, it has been expected that the region of Asia Pacific had emerged as a very promising market in the year 2016 thereby accounting for more than 35% of share in the total market across the globe. In the industry of building and construction, a sustained emphasis on the implementation of energy saving programs and various such campaigns by different government in many nations is fuelling the said market. To be more specific, various government backed regulations are espousing on the idea of the zero-energy building, particularly in coldest parts of the globe, and the same is bolstering the demand for products for thermal insulation. The soaring consciousness about the role played by insulation products in the practices of energy saving practices is regarded as a notable factor. 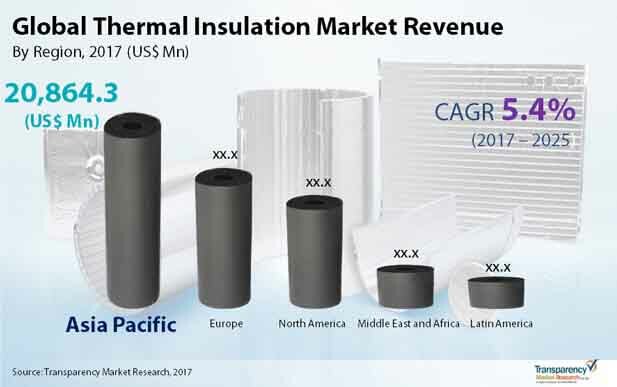 The international market for thermal insulation is triggered by significant demand for technologies of thermal insulation and products in a wide range of end-use industries. Furthermore, the rapidly rising utilization of metal powders in many of the end-use industries, particularly in aerospace and automotive, is also bolstering the demand for better and improved thermal technologies. The soaring usage for insulation products for iron powders in various industries like machinery, energy, infrastructure, automotive, and rail is quite likely to assist in the fast expansion of the said market. The information shared in this review is based on a TMR report, titled, “Thermal Insulation Market (Product - Cellular Material, Fibrous Material, and Granular Material; Foam - Rigid Board, Rigid Foam/Foam Board, Flexible Foam, Sprayed Foam, Batts, Loose Fillers, and Barriers; End-user - Building & Construction, Oil & Gas, Aerospace & Aviation, Mechanical Systems, Clothing, Automotive, and Industrial) - Global Industry Analysis, Size, Share, Growth, Trends and Forecast 2017 - 2025”.